The photo electric tape reader used with all SLO-SYN Numerical Controls is also manufactured by The Superior Electric Company. The reader combines the reliability of SLO-SYN stepping motors with the dependability of photoelectric design. Silicon photo diodes sense light as it passes through holes in the tape. These signals are amplified into full "on" or "off" voltage levels. Each combination of holes represents a coded number. The light source is operated at a reduced voltage for longer life. SLO-SYN Photoelectric Tape Readers are low-cost. Medium-speed perforated tape reading and storage devices. They combine the dependability of photoelectric design with the proven reliability of SLO-SYN stepping motors. There are no detents, ratchets, belts or gears. Maintenance is at a minimum and reliability at a maximum. Program and data input to computers, numerical control systems, process control, communications, test equipment and digital to analog converters; to name but a few of the many possible applications. Models having the 5 volt logic outputs are DTL and TTL compatible. Silicon photo diodes sense the light as is passes through holes in the perforated tape. The resulting signals are amplified into full "on" and "off" voltage levels. Each combination of data channels represents a coded number. The light source is operated at reduced voltage for longer life. 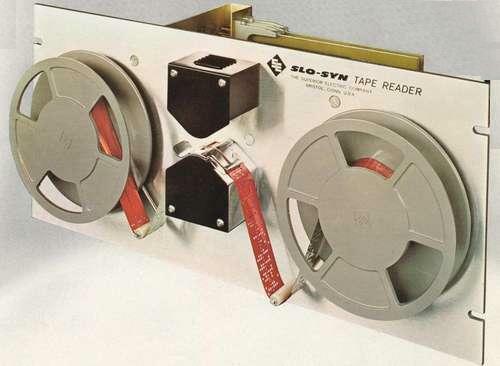 SLO-SYN Photo Electric Tape Readers are adjusted at the factory to read all tapes from opaque metallized Mylar to oiled translucent paper with a maximum light transmission of 40%. A slo syn stepping motor directly drives a large 50-tooth sprocket. The stepping motor is driven by a slo syn translator. Pulses received on either the forward or the reverse input cause the sprocket to move the tape asynchronously one character per pulse. A side movement of the tape guide cover permits full view loading. The tape contacts a minimum of seven sprocket teeth which serve as a tape guide and assure long tape life. 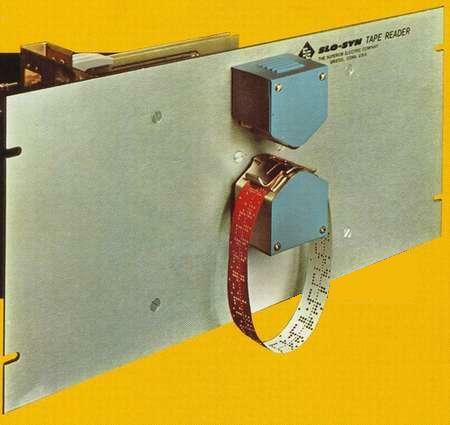 Reel types have two tape handling reel assemblies. Each reel assembly consists of a reel, a constant torque drive, a tension arm and a "on" and "off" switch which is operated when the tension arm is in the raised position. No clutch mechanical drive or switching servo system is used. Each reeler operates independently and allows high-speed spooling when the tape is not passed though the read head. If loop tape operation is desired, the reel assemblies can be disengaged by placing the tension arms in the raised position. 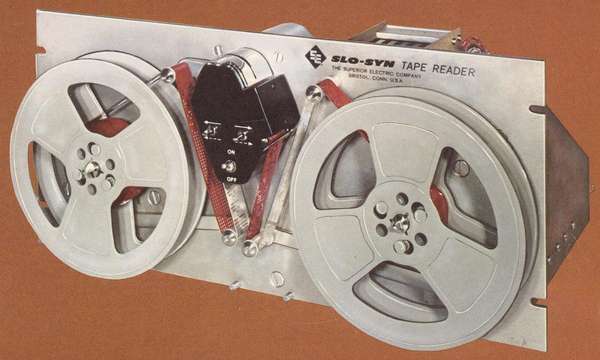 The front flange of each reel can be removed for loading and unloading tape or the entire reel can be unsnapped from its hub for storing a tape. When ordering extra reels, specify part no. EHM144170-G3 for 6" reel models and EHM144170-G1 for 7 1/2" reel models. The 6" and 7 1/2" are not directly interchangeable. However, conversion kit BM144195-G1 is available for changing 6" reel models to 7 1/2" reels. If you want more information then you may read or download the latest TRP125 manual (1982) as PDF file.